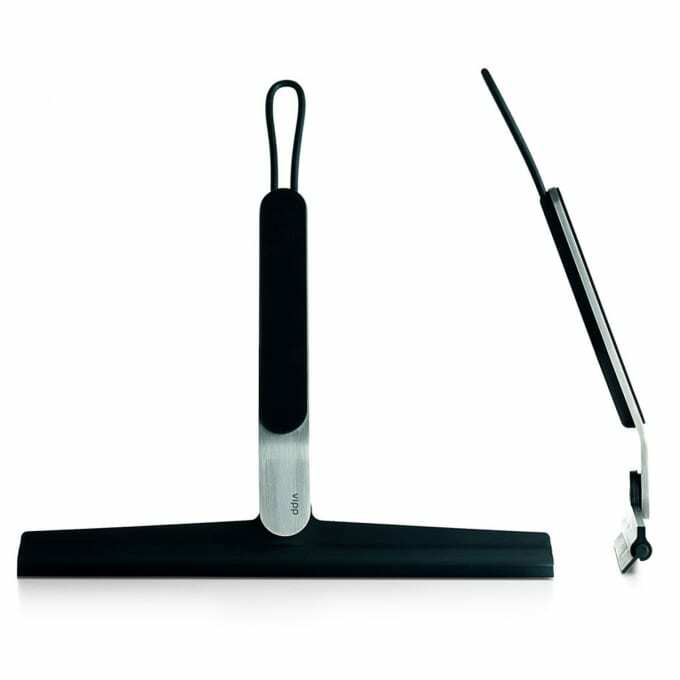 Shower wiper with rubber-covered stainless steel handle and replaceable wiper blade. The rubber strap makes it easy to hang up the shower wiper after use on the supplied hook. The shower wiper has a replaceable wiper blade in soft rubber, which easily removes water from smooth surfaces. The handle in rubber coated solid steel has a good weight, while the soft edges protect surfaces. The rubber strap makes it easy to hang up the shower wiper after use on the supplied hook The design of the Vipp shower wiper matches the bathroom collection from Vipp. Maintenance: Stainless steel surfaces should be cleaned and polished with a microfiber cloth, glass cleaner or other non-abrasive and gentle cleaning agents. Lacquered surfaces should be cleaned with a moist cloth. Rubber parts should be cleaned with a moist cloth. Apply silicone spray for better finish. Vipp products with dark surfaces should be cleaned with a soft brush and, if stained, with a bit of water. Then wipe with dry cloth. Do you have a question about "Vipp 2"? How can we contact you?